Flash media has become an increasingly popular media for distribution purposes applied by various kinds of electronic devices to store and distribute data. 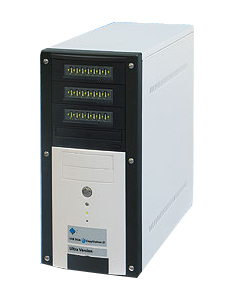 ADR USB Copystation 21 Ultra is a high speed and highly efficient device providing an easy copy solution supporting 21 targets. Each slot has an independent and dedicated channel which supports a data transfer rate of up to 75 MB per second. Regardless of whether you're copying to 1 or 21 target USB-Sticks the copy speed is not affected. For example: Copying 21 USB-Sticks with 512 MB capacity takes just 2.5 min. This result shows that the ADR USB Copystation 21 Ultra with 75 MB/s is 50% faster than other known Copystations with just 50 MB/s.